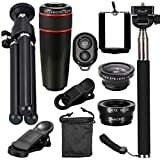 MyArmor Alumium Alloy Telescop Selfie Stick (30 – 93cm) Folding Self-portrait Extendable Monopod with Phone Mount Clip + Metal Tripod Stand + Bluetooth Shutter Release Universal Compatible with Gopro Hero 5, 4, 3, 3+, 2,1/ Sony Nikon Canon SLR DSLR, RICOH THETA 360° / Action Cam SJCAM SJ3000 SJ4000 SJ5000 SJ6000 ect. 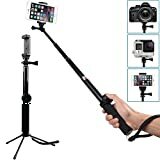 The selfie stick made of unique lightweight aluminum alloy, rugged and waterproof. Shrink at the weight of the camera to lock if you rotate. Bluetooth Remote- Simple and Easy Wireless Set-Up. Long distances for use, up to 3 meters. 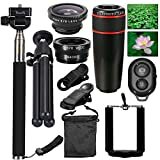 Stable, sturdy metal with folding tripod. Available in video, photography and Smartphone stand, camera stand, time lapse Photography, etc..
Drop-out prevention arm strap. Slim design, ideal for mountain climbing, shooting, etc. * if you use heavy camera for self shooting, use the shortest stage for recommend. 1. Long press the button for 3 seconds till the blue light flash. 2. Turn on the phone Bluetooth, search the new devices and connect ECOBOOT. 3. When match and connect, open the camera software of your phone. 4. Press the Bluetooth button directly to control the camera.